The Altami Studio Contour program is designed to visualize the process of contour part processing by applying a part contour in DFX/DWG formats to the video image obtained from a digital camera. The software of the machine provides support for various types of cameras, which allows you to reconfigure the optical and permissive parameters of the supplied machine, for example, it is possible to install a camera at a higher resolution or speed without changing the software itself. Manufacturers of supported cameras: Altami, Basler AG, XIMEA, Matrox, etc. The software provides import of the workpiece drawing in the standard DWG / DFX format. To solve the task of comparing the drawing of the workpiece and workpiece during the processing, it is possible to import the drawing of the part. After importing the theoretical contour, the software calculates the position of the vector contour data according to the current coordinates of the caliper sensors and the machine table. To determine the linear position of calipers and a table in the machine, LIR-DA7 linear displacement sensors are installed. The displacement measurements discreteness by the sensors is 1 micrometer. The sensors data is used to synchronize the movement of the part/circle contours with the table/slides actual movements. The basic principle of machining a part in an optical grinding machine is to contact the grinding wheel and the part. As during the operation the grinding wheel rotates at high speeds and produces a vertical movement; there is no clear circle boundary on the image obtained from the camera, which leads to an error in the part processing, because the visual perception of the contact point between the circle and the part is difficult for the operator. The stroke circle is programmed with a vector contour to overcome this effect and increase the software processing accuracy, the movement calculation of which is later synchronized with changes in the sensors readings for moving the calipers. The software background / detail mode is designed to simplify finding the part real boundary in the image. When observing a normal image from a camera, there is a luminance transition on the part boundaries that can reach up to 20 pixels (or 2 μm) with the maximum optical magnification of the image, which during processing makes it difficult to determine the part exact boundary. The software introduces the background / detail mode to determine the exact boundary (with an error of 1 pixel), which allows you to locate the exact boundary for the brightness information within the boundary. The background image (backlight) is displayed in white, and the part or circle is black in this mode. To simplify the operator's work, the system supports the software switching of the increase in the telecentric objective by selecting an increase from the list. Also, when the lens is switched, the contour is precisely scaled according to the new magnification. To configure the machine for a specific type of camera, the software provides a universal mechanism for setting up cameras from different manufacturers. For adjustment, most of the camera parameters are available - exposure, gain, white balance and many others. After setting up the camera, the settings are saved and blocked from changing, which prevents accidental changes of parameters and further loss of accuracy during processing. In the software, in addition to the visualization of part processing, the main functionality of the Altami Studio program is also supported, allowing measurements on the live image while the program is running. Possible types of measurements - length, width, radius, diameter, area, etc. for working with cameras you need a free USB port on a separate USB hub for each camera. 1. Module development for data processing of LIR-PCI sensors. The machine is equipped with linear displacement modules LIR-DA7 that convert the linear movement of the machine table into a digital value. We developed a software extension module that allows us to read this value, and use it to calculate the contour linear displacement in the image. 2. Development of DWG format conversion module in Altami Studio vector format. With part processing, the machine software allows you to use the drawing in DWG / DFX formats and "overlay" this drawing with a video image. This function is convenient for processing large parts that do not fit into a machine lens single field of view, with moving sensors contour attached to the readings, the operator will not suffer any loss in processing accuracy. Altami developed a module that allows you to convert a drawing in DWG / DFX format into an internal vector format of the program. 3. Development of the module for contour movement synchronizing on the screen with the sensors readings. In addition to synchronizing the movement of imported DWG loop and sensor readings, a software module was developed to calculate the contour position in the image as a result of changes in the LIR-DA7 sensor readings. To program the lens (changing the resolution, calculating the current magnification), a program module was developed for controlling the lens. The operator can select the working magnification without switching it physically on the lens (as was done on earlier versions of the machine). When changing the working magnification of the lens, a small displacement (about 20-40 μm) can be observed. This shift leads to a loss of accuracy during machining. In order to compensate for this bias, a software mechanism was developed that takes this shift into account. In order to correctly move the contour according to the readings of the motion sensors, Altami developed a software module that allows calculating the calibration factor for the image and the displacement sensors readings. With grinding wheel working, the boundaries of the circle are usually blurred on the video image due to the vertical oscillation of the grinding wheel. During processing blurring the boundaries of the circle contour caused a loss of precision, because the video image operator could not determine the exact location of the circle and the object being touched. Altami developed a software module that allows you to get a vector contour of the circle while the machine is working and make it move according to the sensors readings for moving the machine's calipers. Moreover, this module allows you to calculate the angular movements of the contour of the circle when turning the calipers of the machine. 8. Development of an algorithm for calculating automatic object-background binarization. To uniquely visualize the boundary of an object on a raster image, Altami developed a module that allows conversion from an image in gray scale to an image in gradations "0" and "1". In this image, you can more accurately determine how much the real object after processing complies with the part contour. During the implementation of the technical task, it was found that with each change of magnification, the lens optical axis shifts to a short distance (about 20-40 μm). This shift leads to an error in the part machining. To eliminate this bias, a software algorithm was developed that allows you to calibrate the shift and which should be taken in changing the position of the lens. During the first realization of the technical task, the scale factor was calculated by using the passport value of each magnification supplied with the lens. At the stage of the machine experimental testing, it was found that calculating the calibration through this rate leads to errors in theoretical contour calculating the displacement. Altami developed a software algorithm that allows calculating calibration using the existing hardware of the machine (high-precision linear sensors). 3. Calculation of the circle contour angular parameters. It was assumed that the calculation of the machine angular movement will be done by installing special machines on the machine in the initial implementation of the technical task. it was found that calculating the angles with their use is quite difficult for the operator to understand in the course of experimental testing, because it is necessary to perform a large number of actions for calibration (installation of sensors, input of correct indications in the software). 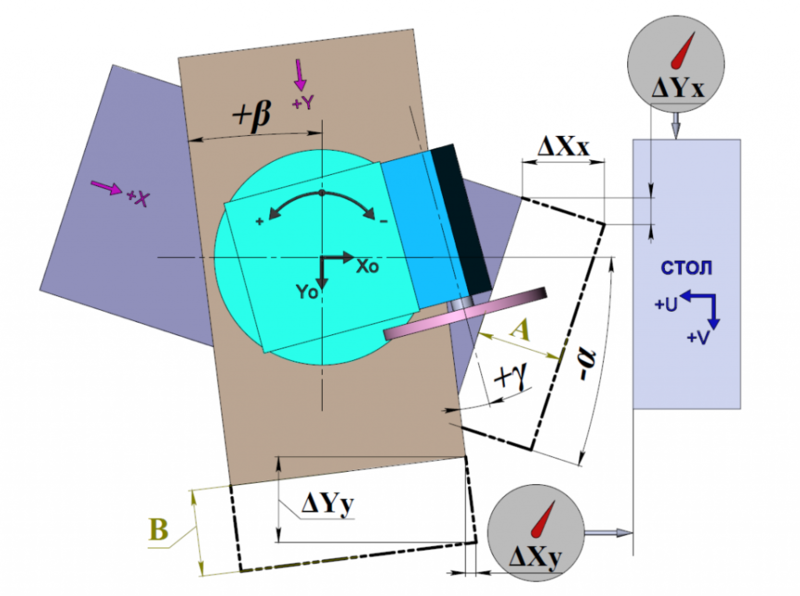 The method was proposed to simplify the process of calibrating the calipers angle that allows calibrating those by means of image processing means and built-in sensors for their angular movement. The proposed method showed sufficient accuracy (the angle is determined with an error of several angular minutes, which is sufficient for the problem). 4. Image automatic binarization algorithm. During the experimental testing of the machine it was found that when working with the image and the contour of the part, it is difficult for the operator to determine the exact boundary of the part, since in the image, the boundary of the part is represented by a smooth transition of brightness, and it is rather difficult to determine in which particular place the exact boundary of the part passes. To simplify the work with the image of the part, an algorithm was developed for converting an image in gray scale to an image in gradations from "0" to "1". This transformation simplified the verification of the machined part image for compliance with the theoretical contour of the part.